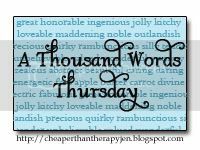 Want to join me in A Thousand Words Thursday, read and grab my button from HERE. Then write in your name and the URL(permalink) in the new MckLinky below. Adorable! Isn't it amazing how fast they change a grow. 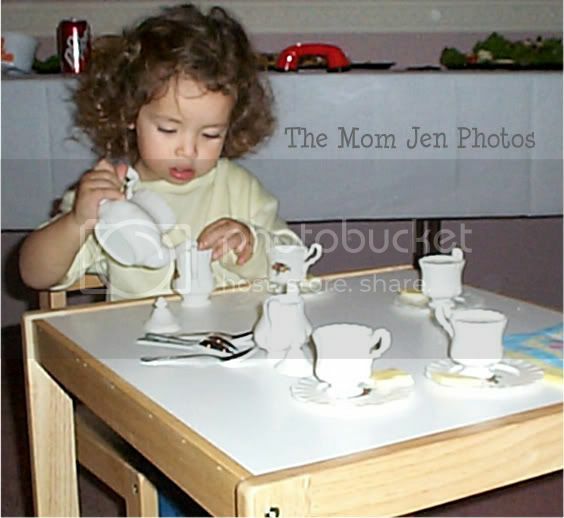 I bet you wish you could have some tea from that little girl right now! I'm thirsty. I'd like some too please! Wow, your girls look alike. Yeah, my girl just got an ipod for her birthday. How times change! Aw, I love this picture. What a sweet photo. 11! They grow so fast! My oldest is turning 3 on the 11/12. And my youngest 2 on the 11/27. I might take that tea set idea into consideration. Yet I think my girls would like an iPod too. Alas, ipods are the new tea set! That is so stinkin' sweet! That's really precious moment there.It was just like yesterday that you were chasing her around eh! That is just precious. I bet it totally flew by too didn't it? And I'm not looking forward to 75, fyi. Love the picture! She shares her bday with my grandmother & her twin sister. They'll be 84. Oh my heart breaks for you! These darn kids just grow TOO fast! Such a great picture... time flies hey??? Im always sad when favorite toys are outgrown..